Buddy is a platform that helps us to speed up all those tedious and interminable steps, allowing us to focus on the fun part of this process. "Buddy exists since 2015 and since then has established alliances with: Github, Google, Azure, among others. currently has clients, highly respected brands that require their services to automate their application development operations, among these we can find: Breathe, INC, flow, among many others". 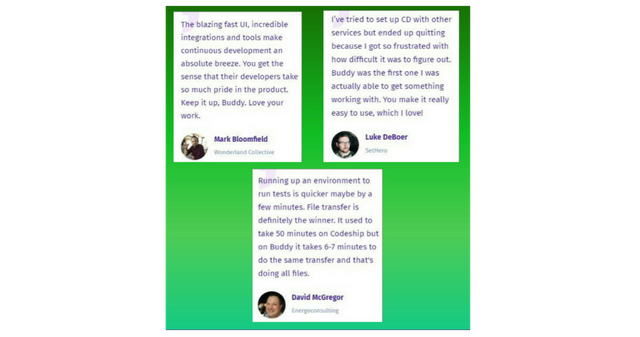 Already many developers have tried the great tools of Buddy and have been amazed with the result, ensuring that it is easy to use and fast. Samantha wants to create a platform in the blockchain in which she wants to sell some items, such as clothing, shoes, makeup, among others, but it turns out that the process was very difficult and tedious, to the point of almost giving up. But, Samantha, in search of a last opportunity, began to search the Internet for an easier and faster way to realize this new idea she had, and found Buddy, was very surprised and decided to use the tools that this platform offered, Samantha was amazed with the service so fast, easy and efficient that the platform provides. It was totally incredible that Buddy did such a tedious job in a short time, allowing her to focus on the funniest part, the one that really mattered to her. "Buddy will use BUD tokens so that developers can buy and in turn win in the automation market." Some people when thinking of applications, the blockchain or simply technology as such always see it as something futuristic, but it is not so, technology and everything that makes it is very present in our lives, we can now buy and sell things through the internet, we can communicate with people who live far away from us, among many other advantages that this new reality offers us.